1- Because of the large surface area of the disc and the type of material used between the discs, the amount of friction can easily be adjusted. This allows different size telescopes to be used and eliminates the need to rebalance when various size and weight accessories (e.g. eyepieces, cameras, etc.) are used on the telescope. 2- Since friction disc assemblies are used, no axis locks are required to hold the telescope in place while changing eyepieces, etc. Most mounts use bearings to allow the shafts to rotate freely, but this causes imbalance problems while changing accessories on the telescope. 3- The mount allows for easy transfer between light and heavy loads (eyepieces, cameras, etc.) without rebalance. 4- Axes are inherently orthogonal allowing greater pointing accuracy. Because mounts require two axes (three when the telescope to mount interface is considered) their shafts must be at right angles. Due to the complexity of mounting the shafts at right angles, it is very difficult to keep the two shafts orthogonal. It is very easy to make the discs (which are theoretically the shafts) orthogonal. It is also very easy to mount the telescope so that it is orthogonal. 5- Direct mounting of encoders (when used) allows easier mounting and greater position precision. Since the center shafts terminate at the edge of the disc, the encoders can be mounted directly to the shaft end. 6- Both shaft encoders (when used) are on the same plane of the axes so battery powered astronomical object locaters (such as the Sky Commander), etc. can be used without cables interfering with the mount. 7- The mount is compact in size and does not have long shafts with counter balance weights to remove for storage or transporting. 8- The telescope can aim from below horizon to over head. 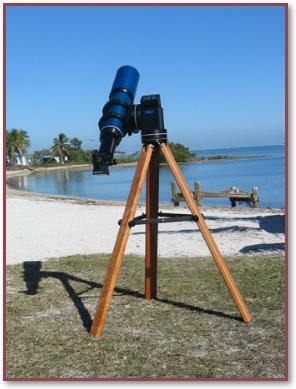 Because the telescope is mounted to the side and hangs over the mount the only restriction is the tripod or pedestal support. 9- Rigidness is inherent to the design of the mount. Vibration can only take place at the telescope, the telescope intersection with the mount, the pedestal, or outside occurrences (ground moving). Because there is so much surface area and the two axes are not separated there is very high vibration dampening. Mounts with arms and long shafts have problems with vibration and must be made large and bulky. 10- The mount can be used with astronomical or terrestrial telescopes.